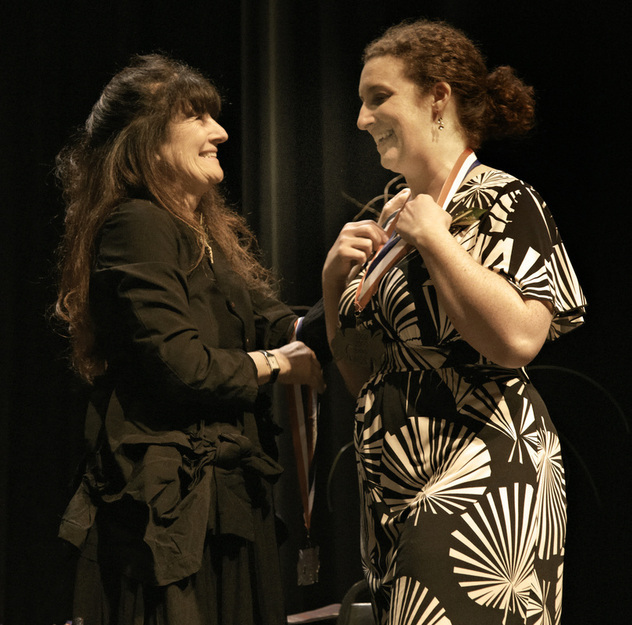 Ruth Reichl presenting 2014 Good Food Award for Confections to Rebecca Cassity of Serendipity Confections. Photo credit and copyright: Marla Aufmuth, MCA Studios. Good Food Awards, 2014 . . . There is a group, the Good Food Merchants Guild, which recognizes and encourages the production and distribution of truly GOOD food—food that is “tasty, authentic and responsibly produced.” When you stop and think about it, there’s an awful lot out there that we eat that doesn’t fall into this category. So the Good Food Awards take into consideration not just the taste of the food, but also the ingredients from which it is made, and the impact of its production facilities and processes on the environment and workers. This is a national competition and the standards are high. This year the awards were presented for a variety of food products: Confections, Cheese, Charcuterie, Preserves, Coffee, Chocolate, Spirits, Beer, Pickles, and Oil. (This includes some of my favorite food groups.) The judges had the daunting task of narrowing down around fifteen hundred entries to a handful of the very best in each food category and the winners are amazing people in their commitment, in their products, and in their passion. Often these people speak of the Good Food Movement or the Slow Food Movement, or Farm to Table, or Sustainable food production, and even Organic Agriculture, and these all are important aspects of the kind of values and production that they represent. Often times, but not always, they are small, “mom and pop” or family based operations. Really often they are locally sourced and they get their materials and ingredients from similar operations and farms within a short distance of their own facility. Rebecca invited us to attend the award ceremony at the Palace of Fine Arts in San Francisco in January—a delightful opportunity for us for many reasons. Thank you, Rebecca! It was great to see her on the stage receiving her award and to see the other “good food / slow food” producers recognized. It was also good to hear the keynote speaker, Dr. Ezekiel Emanuel, a physician, bioethicist, and health policy wonk who has served in a variety of government positions and from whose columns in the New York Times I have learned much. But, with due regard to Zeke Emanuel, I was especially interested to hear the food producers themselves as they talked about what they do and why they do it. These people don’t make a living giving speeches; they make their livings making food for us to eat. So they speak honestly and from the heart. One person from each food category talked about their operations and those of their peers. They talked about the social and agricultural commitments that brought them to this kind of endeavor. They talked about the family backgrounds that helped introduce them to slow food and good food. They talked about how they combined good business and good food, how they respect and honor both tradition and innovation, how they see their production as part of an environmental cycle that they both contribute to and draw from, and how they manage small businesses in a world of industrialized corporate food distribution. They talked about their travels, their experiences, their “Aha!” moments that helped them see connections between what is grown and what is eaten, between what is put into a food and what we put in our mouths. Without exception, each one of the producer-speakers offered powerful perspectives on their crafts and their lives, each one with important social and economic implications. This was a wonderfully intense and thoughtful learning experience. Consider what Andy Hatch, a cheesemaker from Wisconsin, said. Hatch, a young-ish man who manages Uplands Cheese, a family-run dairy farm, held up a well-worn copy of Julia Child’s classic cookbook which had been handed down to him from his grandmother and also passed on a jewel of advice handed down from the same grandmother: “Fall in love with the process, not the product.” Those profound words, a philosophy no less, speak to the way we live our lives. Hatch—and his grandmother—may as well have been talking about government, economy, or anything else under the sun, not just a food item, not just cheese. The awards themselves were presented by two icons of the slow food / good food movement: Alice Waters, of Chez Panisse in Berkeley, succinctly identified on her restaurant’s website as “an American pioneer of a culinary philosophy that maintains that cooking should be based on the finest and freshest seasonal ingredients that are produced sustainably and locally. She is a passionate advocate for a food economy that is ‘good, clean, and fair.’” And Ruth Reichl, who was Editor in Chief of Gourmet Magazine and before that food critic for the New York Times and the Los Angeles Times as well as Berkeley restaurateur. In my photos below Ms. Waters is seated on the left and Ms. Reichl on the right. Ruth Reichl presents the award to Rebecca, although last year Alice Waters presented it to her. Congratulations Rebecca and Russ! Outstanding! The day after this great ceremony (and its fun and savory reception) we were joined by our other daughter, Jessica, and we all picked up my cousin Anita and spent a day and a half partaking of good foods and wines in the lower Sonoma Valley. Fabulous family time in a special place. Here are some photos from our outing.